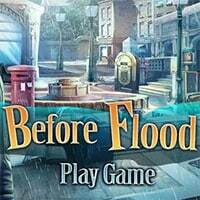 Before Flood Game: A small town is expected to be struck by floodwaters in the early hours tomorrow. Following heavy rainfall in the past days. This combined with the rivers overflowing, means that water will enter in each household. The mayor immediately called about evacuating the homes of the residents to safety. Everyone will be taken to other temporary homes. Additional staff were brought in to assist with the evacuation. While others worked extra hours to ensure that the residents are safely relocated to other places. Larry and her daughter Ruth lead a group that needs to be evacuated from their homes. In order to evacuate the people certain objects are needed, but also a lot of courage. No one in the group had a similar experience before, so everyone must work as a team. They will work around the clock to ensure that this difficult situation will be handled as effectively as possible. There is no greater weapon in a group’s arsenal than a great team. Would you like to join this team and help people escape this serious flood? Enjoy and have fun in playing Before Flood Game.